Tripp Lite offer an array of cooling solutions which target temperature control, lower operating ... that provide large amounts of cooling power but require space in the rack row. SmartRack cooling solutions pack powerful cooling into compact footprints. They help prevent equipment problems caused byoverheating and temperature fluctuations. Close-coupled cooling delivers cold air near the IT heat load to help prevent recirculation of warm air, improve predictability and enable right-sized modular cooling for efficient expansion. The harder your data center, network closet or server room works, the more it heats up, leading to inefficient operation, weakened performance and raised cooling costs. 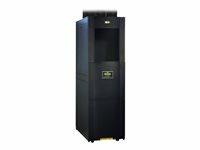 In fact, cooling can consume more than half of the power used by a high-density installation - start saving power and money with Tripp Lite's SRXCOOL33K today! The SRXCOOL33K provides 33000 BTU of efficient, reliable cooling in a 42U rack form factor. It features cutting-edge components that limit inrush current and enable precision cooling adjustments to minimize power consumption, maximize cooling and improve your application efficiency. By delivering cold air high in the cold aisle, the SRXCOOL33K promotes temperature uniformity from 1U to 42U, allowing your equipment to perform at its peak. Maintenance is no-hassle due to the self-contained design, which requires no water collection tank or extra plumbing, while RoHS compliance and eco-friendly R410a refrigerant means you'll never have to worry about meeting environmental standards. Easily install your SRCOOL33K ductwork using Tripp Lite's SRCEILINGADAPT with pre-tapped duct holes. The SRXCOOL12K SmartRack 12,000 BTU 230V Portable Air Conditioning Unit pumps 12,000 BTU of cooling power into your IT environment to prevent shutdowns, malfunctions and failures caused by overheating or fluctuating temperatures. Part of the SRCOOL line, this compact, portable unit is perfect for server rooms and other IT environments with heat-sensitive equipment in areas that facility air conditioning can't reach. The self-contained SRXCOOL12K is capable of cooling a small room using its louvered vent. A built-in evaporator expels the condensed water through the directional exhaust duct, eliminating the need for a drain tube, drain pan or water collection tank. 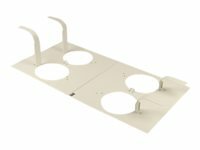 You can also use the included flexible tube to aim the cold air precisely where it’s needed most, such as an overheated rack enclosure or an equipment hot spot. 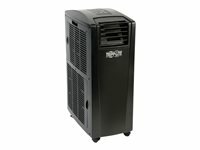 The SRXCOOL12K also dehumidifies and filters the air, providing better air quality that can enhance equipment performance with little power consumption. Designed for quick, simple installation, the SRXCOOL12K rolls on durable built-in casters and plugs into a standard Schuko CEE7 outlet. It’s programmed to restart automatically after power failures, and you can set the built-in timer for unattended shutdown and startup. By installing the optional SRCOOLNET remote management accessory (sold separately), you can also monitor temperatures, receive alerts, review logs and control settings from anywhere via SNMP, web browser, SSH or telnet.